Air Popped Popcorn Kernels: Our popcorn is air-popped which means we just heat the popcorn kernels -- we don't have to rely on oils or other agents that are used in kettle popping. The results are the purest form of fresh and evenly popped popcorn, that when mixed with our own recipes, is a taste that you are sure to love. Our Own Popcorn Recipes: Have you ever gone to a movie theater and seen those little jars of popcorn flavors you can sprinkle on your popcorn? 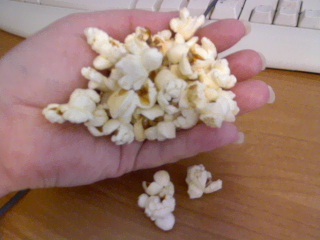 That is NOT how we make our gourmet popcorn. We've developed our own custom popcorn recipes over the years and we're always working on creating new and innovative flavor combinations. Some of our recipes are seasonal flavors that are only available for a limited time and others are popped and made daily for your enjoyment. I was given the chance to choose 2 flavors from PopCorn4All So my husband chose *Ranch* And I chose * Chocolate Cherry* We both like popcorn and he likes to sprinkle his home made popcorn with powder ranch, dry Parmesan cheese, or greek seasoning. And i like my popcorn on the sweet side thats why i chose chocolate cherry, because i grew up on popcorn balls at the fair and on halloween, or i munch on some toffee or carmel corn. while at home i drizzle my pop corn with pancake syrup it's what i grew up on and it's what i like to this day. If Chocolate Cherry Or Ranch does fit your taste buds try one of these. 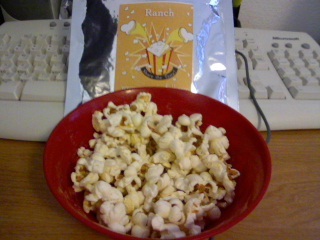 My husband Nor I was impressed with PopCorn4All Ranch at first, when we first tasted it tasted just like a regular butter popcorn with a "Slight" taste of ranch. But then i took some out of the bag and ate a little bit from the bottom i relized quick that all the flavor was on the bottom of the bag. So after taking pictures (Seen Above) i put all the popcorn back in the bag and shook the bag and re-tasted it i thought that was a HUGE improvement to what we tasted the first time. My husband also liked it alot better the second time. 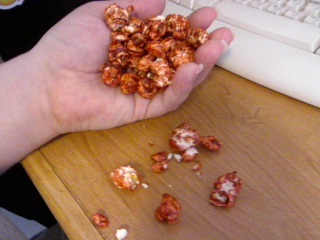 Its still not my favorite since i'm a sweet popcorn OR LOTS of BUTTER gal. It was something that if given to me i would eat it. 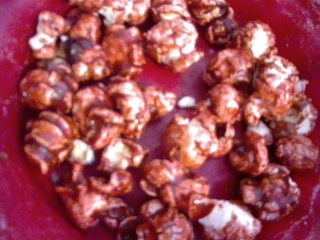 ♥ I'm Inlove With Popcorn ! ! 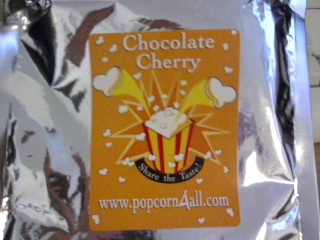 I have had some Yummy popcorn before But none of it has anything on the Popcorn4All Chocolate cherry! As you can see in the picture about my husband and i devoured the chocolate cherry. I had to do the review almost as soon as i opened it if not i would have not had any popcorn left to take a picture of. This is by FAR my favorite popcorn of all times. within one popcorn kernal you can taste the sweetness of the chocolate and tart of the cherry and the savory of the button. Oh so good! If you have a sweet tooth anything like me i recomend you try this kind. It's AMAZING! Special Thanks to : David Heath And the Popcorn gang for my wonderful samples!